As an important step toward realizing its vision of being among the top 20 public research universities in the country, the University of Kentucky recently decided to build thousands of new dormitory rooms, and require many more students to live on campus. As a community member, I have heard that the reasoning is that on-campus students are more likely to graduate, and that increasing graduation rates is a crucial aspect of improving the University's status. UK chose to outsource construction of the dorms—without dining facilities. Although no final decision has been announced, recently UK has signaled that it is considering outsourcing dining services as well, apparently because corporate food service giants have the capital to build several dining halls and then recoup construction costs as part of a long-term contract. Estimates I have heard publicly range from $5 million to $50 million for dining facility construction. The respected UK Dining Services, which now feeds dorm students and central campus (not the medical complex, and not athletics) is an in-house, UK-owned entity. It cannot raise the capital to build the new dining facilities unless the University chooses, and the University, so far, chooses other capital priorities other than dining halls. UK Dining Services boasts an excellent record on food quality, strong commitment to buying food from Kentucky growers and processors, and importance as an employer of both full-time and part-time workers. 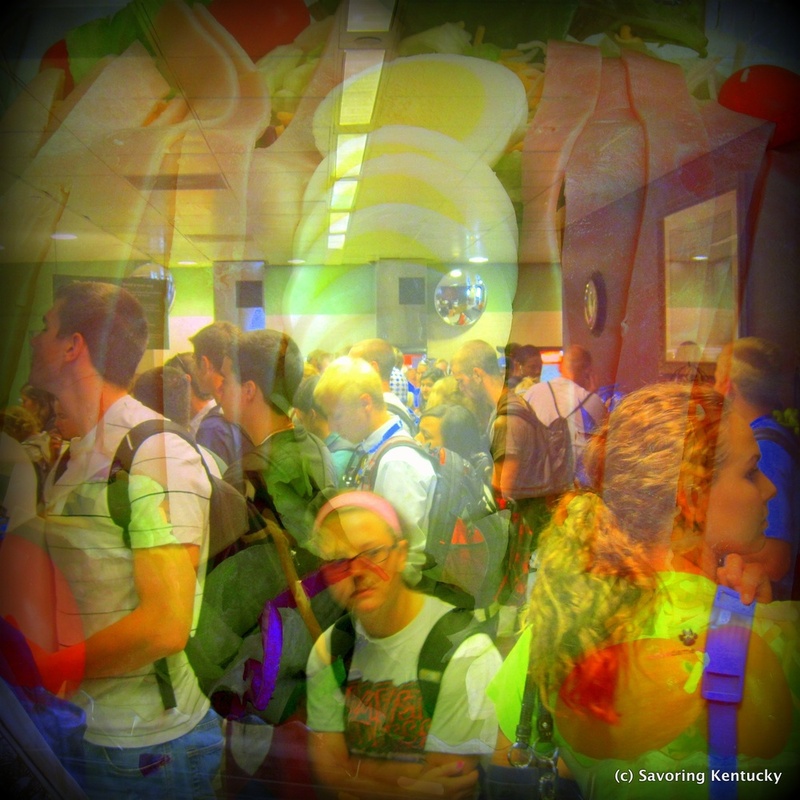 Many people, particularly the well-organized UK United Students Against Sweatshops, have been working to encourage UK to expand UK Dining Services to meet the new dining facilities need. I spoke on this issues last night at an on-campus forum on Outsourcing UK Dining Services. The Tracy Farmer Institute for Sustainability and the Environment hosted the forum. My statement follows. Along with many others, I have called for the University to expand UK Dining Services to serve the new dorms and the replacement dining facilities envisioned in the dining plan. University responses have included this language: "we owe it to our students to explore every avenue for making our services as efficient and effective as possible." That consideration of efficiency and effectiveness has pointed toward soliciting private capital investment in new dining facilities. University of Kentucky Dining Services excels in serving students and boosting local food economies in the Commonwealth. It is in jeopardy. I ask that University decision-makers develop and apply criteria based on deeper, permanent efficiencies that fit well with the University's mission: "The University of Kentucky is a public, land grant university dedicated to improving people's lives through excellence in education, research and creative work, service, and health care. As Kentucky's flagship institution, the University plays a critical leadership role by promoting diversity, inclusion, economic development, and human well-being." Using that statement as a frame, and giving particular attention to its emphasis on education, creative work, service, health care, and economic development, I suggest four specific opportunities for achieving efficiencies of lasting benefit and effectiveness to the Commonwealth the University serves. First, when UK students find it easy to eat well-prepared, delicious, nutrient-rich food, the state as a whole benefits from their improved health. Many UK graduates become our neighbors in Kentucky cities, towns and counties. In addition to the reduction in costly chronic diseases for which we may not have to fund treatment, these student's good health, once they graduate and start families, will have a positive impact on Kentucky going forward. This yields the long-term efficiency of good public health. Second, when UK does business with Kentucky growers and processors, that money makes positive ripples in Kentucky's communities. When community income improves, public schools tend to improve. When schools improve, graduates tend to come to college better equipped to thrive and graduate. This effective education dividend, so important to the University's top 20 vision, is built partly on the long-term efficiency of investment in strong local economies. Third, when UK Dining Services collaborates with academic departments to introduce students to careers in food and agriculture, students build skills to succeed in food-based jobs. When those students graduate, make jobs and take jobs in any aspect of Kentucky's growing food economy, our state efficiently profits from their work and their tax dollars. All of us stand to benefit from the long-term effectiveness of good career preparation. These three deep sources of efficiency and effectiveness could conceivably be delivered by an entity that is not part of the University, and not part of Kentucky. But one final important deep efficiency cannot. Any outsourcing contract may specify food quality, set sustainability deliverables, mandate a percentage from local sources, require employee protections, and insist on collaboration with academic units. What an external food service contractor must do, however, is make money for its shareholders. Right now we Kentuckians are the shareholders in UK Dining Services. In spite of faltering legislative support for the University, we are still the beneficiaries of UK Dining Services' good work. Outsourcing dining services to Aramark or Sodexho ensures that a significant portion of the money Kentucky students are required to spend on dormitory food will leave the state and enrich others. It will, in effect, establish a new extractive industry in the Bluegrass. And so, fourth, the University of Kentucky is a capable powerhouse, and in addition, there's Big Blue Nation. UK itself has the commitment, brainpower, creativity and many mechanisms to live up to the economic development portion of its mission statement by inventing a way forward that meets new, deep efficiency and effectiveness criteria. Among those criteria, the new dining service solution should improve student health, invest in Kentucky's local food economies, equip Kentucky students for excellent work in our Commonwealth's fledgling food system, and keep Kentucky money in Kentucky where it can grow and benefit all of us. Done properly, this new invention can offer new ways for Big Blue Nation to connect to this beloved university. A positive invention will expand a sense of ownership and connection to the University even in years that do not include the pleasure of hanging a banner in the Rupp Arena rafters.